YellowAirplane.com: World War 2 Hawker Aircraft Models. Plastic Model Kits, Diecast and Wood Models. World War 2 Hawker Typhoon Aircraft Models. Plastic Model Kits, Diecast and Wood Models. Collectable Plastic and diecast model airplanes of the World War 2 Hawker Typhoon, a famous World War 2 Warbird and one of the best of the British aircraft made. 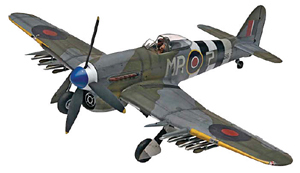 The World War 2 Hawker Typhoon aircraft models come in plastic model kits, diecast model airplanes, mahogany model airplanes and wood model kits. All of these model airplanes are great for the model kit collector and scale model kitplane builder. As the first-ever 1/72 scale, limited edition die cast model of the Hawker Typhoon - one of the most successful ground attack aircraft of World War II - this is a "must have" for every collector! It includes engraved panel lines; wing-mounted cannons; a detailed cockpit with a clear canopy and a pilot figure; a rotating propeller; optional-position landing gear with real rubber tires; the camouflage scheme of RAAF No. 461 Squadron, which conducted the Typhoon's desert trials in 1943; and more. 6" wingspan; includes a display stand. Hawker Typhoon Mk.IB - armed with four Hispano Mk.II cannons - flown by 7-victory ace and squadron leader Basil Gerald "Stapme" Stapleton of RAF No. 247, when the unit provided close air support to ground forces during Operation Market Garden in 1944. "> Click Here for more aviation art.